Flowers, Edible Seeds, & Spicy Greens can add exotic and interesting flavors, colors, and textures to your food. Besides adding nutritional quality, they enhance presentation, and are fun to use sparingly to change things up a bit. This is a great way to let your creativity shine. Edible flowers add both beauty and flavor to any dish. You can use them as an edible garnish, or include them as a sub ingredient in a salad. Get creative! Culinary Uses: Dried Lavender flowers can be used to infuse oils and salts. Lavender Water can be used for desserts, drinks, and sweet dishes. Dried flowers and/or leaves can be used sparingly as an herb for seasoning. Fresh or dried flowers can also be used as decoration. Therapeutic Properties: Antiviral, antibacterial, antifungal. Heals wounds and skin. Particularly effective for burns. Gentle. Used in aromatherapy to reduce stress and depression, help with sleep and relaxation, and to clean the air. Note: See the Bath & Body and Essential Oils pages for more information. Culinary Uses: Dried Rose buds can be used to infuse oils and salts. Rose Water can be used for desserts, drinks, and sweet dishes. Dried flowers can be used sparingly as an herb added to tea. Fresh or dried flowers can also be used as decoration. Therapeutic Properties: Pure essential oil can be used for aromatherapy, skin care, and perfume-making. Neurotonic, aphrodisiac, cell regenerating, regulates liver and spleen, promotes bile flow, anti-depressant. Culinary Uses: Whole fresh flower can be added to salads, or to plate. Can be used as an edible decoration. 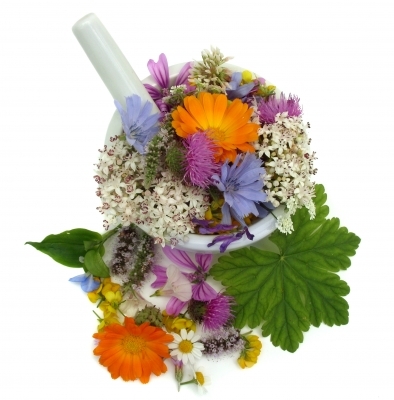 Therapeutic Properties: Natural antibiotic. High Vitamin C content, antibacterial, antiviral, antifungal. Boosts the immune system. Stimulates appetite and improves digestion. Edible seeds are great for adding texture both visually and on the pallet. They add a nice crunch and a burst of flavor. Great sprinkled on anything! Note: Please see the Anti-Nutrients and Grains, Legumes, Nuts & Seeds pages for important information..
Culinary Uses: Used as garnish and flavor. Can be made into a paste or oil. Used for making Tahini. Can be used as a coating, similar to bread crumbs. Therapeutic Properties: Seeds are highly nutritious and have an energetic effect. They contain poly-unsaturated fats, amino acids, antioxidants, minerals and calcium. Sesame helps with insomnia, detoxifies the liver and kidneys, improves the immune system, helps with blood pressure, and increases fertility. Can also have a laxative effect. Sesame Oil can also be used for massage. Culinary Uses: Used as garnish, filling, and flavor. Can be made into a paste or oil. Can be roasted, ground, and mixed into desserts and sauces. Therapeutic Properties: Seeds are highly nutritious. Contains protein, fat, fiber, carbohydrates, calcium, and phosphorous. Believed to be effective in preventing and treating tumors. Research is currently being done on it. Culinary Uses: Can be eaten as a snack. Used as a garnish. Can be made into a paste or oil. Add crunchiness to salads or sprinkled on top of dishes. Therapeutic Properties: Seeds are one of the most nutritious. They are high in protein, unsaturated fatty acids, vitamins, and minerals such as A, B-complex, E, Selenium, Magnesium, and Calcium. Antioxidant, anti-inflammatory, and helps with cholesterol and heart health. Flavor: Similar to Poppy. Not as sweet. Therapeutic Properties: These little seeds are full of nutrients. They are a great source of omega-3 fatty acids, magnesium, zinc, iron, and calcium. They are rich in antioxidants, protein, and fiber. Spicy greens can add that extra umf just when you need it in a dish. Culinary Uses: Used in salads and mixed with other greens. Can be added to sauces or used with other vegetables. Therapeutic Properties: Helps with ulcers. Reduces stomach acid secretion and mediates the activity of hormones. Culinary Uses: Can be used in salads, soups, stews, and added to any dish at the end for garnish and flavor. Therapeutic Properties: Contains Iron, Calcium, Phosphorous, Potassium, Magnesium, Iodine, and several other Vitamins and Minerals. Antibacterial, antibiotic, antioxidant, antiseptic, diuretic, expectorant, helps with regulating the thyroid gland, and is a digestive aid. Culinary Uses: Can be used in salads, soups, stews, or used with other greens. Best if mixed with others, as flavor is strong. Therapeutic Properties: Good source of Calcium and Vitamin C. Cancer prevention properties, liver tonic, helps with digestion. Food can be uniquely beautiful and delicious while providing healing properties and nutrients.